Thank you for reading and commenting on my last post: Which Dress Will It Be? Take A Guess. 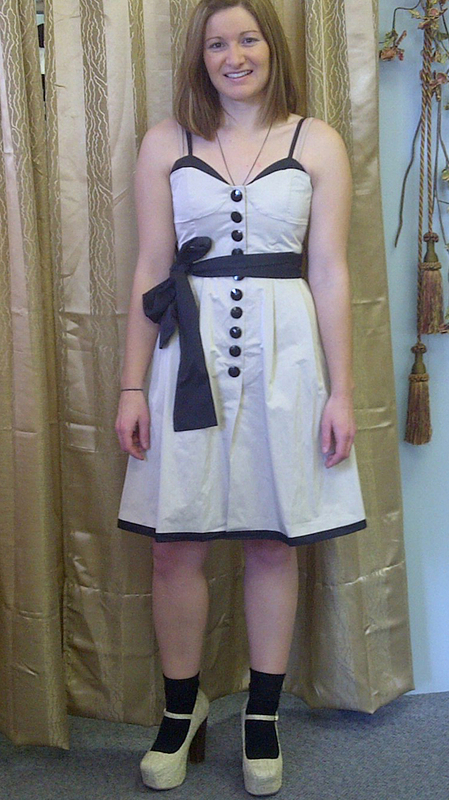 Through my blog, Twitter and Facebook, 14 people guessed which dress they thought I bought in Medicine Hat, Alberta. The majority, 12 people, guessed that I bought the striped dress and only two people guessed the buttoned dress. So why did I choose the buttoned dress over the striped one? Mainly because it’s more versatile, as the helpful saleswoman pointed out. It can be dressed up or dressed down therefore I will probably get more use out of it. Whereas, the striped dress was more dressy. I also liked the neutral colour, black buttons and black trim. And the bow can be removed if I get tired of it. Based on the comments, I think the socks turned some people off this outfit. I must admit that I’m not completely sold on the socks idea! Regardless, you can wear this dress with heels, platforms, wedges or flats, according to the saleswoman. These particular shoes were actually very comfortable, easy to walk in, and certainly gave me a boost in the height department. So what do you think? Did I make the right decision? Do you have any fashion advice for me? I love hearing from you.